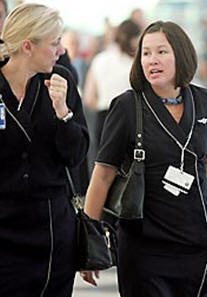 August 29, 2012 - The Association of Flight Attendants-CWA (AFA) at the new United Airlines has begun to set the stage for negotiations on a single contract covering over 25,000 Flight Attendants. These historic negotiations will unify Flight Attendants from pre-merger United, Continental and Continental Micronesia under one agreement. Earlier this year, Flight Attendants from each subsidiary ratified separate contracts, paving the way for joint negotiations. "Unifying under the world's largest Flight Attendant agreement is crucial as we continue to build our future together at the world's largest airline. We are committed to combining the best of our contracts and experiences into an industry leading agreement that best represents all Flight Attendants at the new United Airlines," said Greg Davidowitch, Marcus Valentino and Suzanne Hendricks, AFA Presidents at United, Continental and Continental Micronesia respectively. The Continental–United merger was approved by the European Union in July 2010. On August 27, 2010, the US Justice Department approved the Continental–United Merger. On September 17, 2010, United shareholders approved the merger deal with Continental Airlines which forms the world's biggest carrier. On October 1, 2010, UAL Corporation completed its acquisition of Continental Airlines and changed its name to United Continental Holdings, Inc. The airline received a single operating certificate from the FAA on November 30, 2011. On March 3, 2012, Continental and United merged their passenger service systems, frequent-flier programs, and websites which officially eliminated the Continental name and brand as far as the public was concerned.